We did it. We pulled the trigger. Scott and I are getting a new boat. It was a LONG road to get to this point, the decision was not an easy one. We went back and forth probably a million times. In the end, however, we trust that this is what is best for our family. Many of you suggested we keep Rasmus. It seems you, like us, have a little emotional tie to our beautiful Rassy (okay, and some legitimate reasons as well). Trust us, we get it. We do. However, our family is growing and Rasmus would have been very, very tight with the three of us and our respective gear. Could we have made it work? Of course we could have. But the bottom line is this: We were going to get a bigger no matter what. It was simply a matter of time. We found a great boat, in great shape, for a very good price (after negotiation) that would be perfect for our family. After thinking long and hard we decided: why wait? This boat, aside from the deck issue (which we are being compensated for after getting two quotes) is impeccable. She is meticulously maintained (just how we like 'em! ), and has just about everything we were looking for. 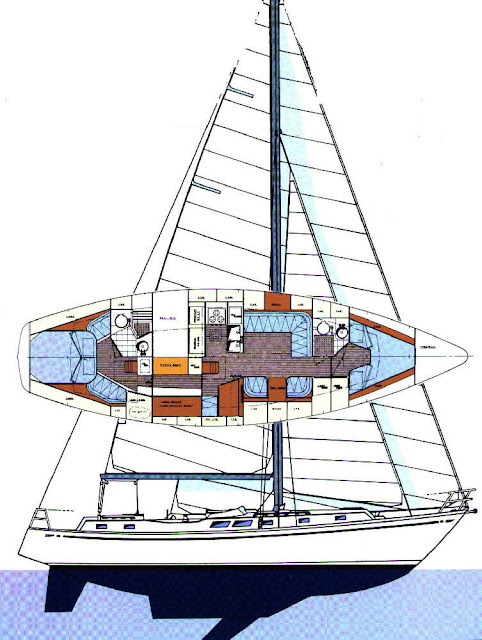 More space, two heads, cutter rig option, center cockpit, swim scoop, lots of deck space, low engine hours, decent canvas, and the ability to control all sails from the cockpit...in other words, the bones of a great family cruising boat. She has a gorgeous interior with a nice, spacious layout, a U-shaped galley (something we really wanted), an aft suite with a king size bed, two heads and TONS of storage. Did I mention how much we love her cockpit? It is the very best feature of this boat because it is HUGE. HUGE. Perfect for entertaining and containing little rug rats. We loved the Brewer 44 design from the minute we set foot on her and feel 100% confident that this is the boat for us. In fact, she's kinda like Rasmus on steroids... Did I mention that the Brewer is considered one of the 10 Best Center Cockpit Cruising Boats? No surprise why; they are strong, stout and fast. There is so much more to tell you about the decision making process but I need to break it down into a few posts or else this one will go on forever. I know many of you were rooting for Rasmus, and believe me we definitely considered going back to her. We weighed all the pros and cons and looked at this from every angle. The new boat won. It was not easy. In fact it was really, really hard. Which makes the fact that this decision has been made all the better. Sigh. Time for a new chapter to begin. Hang on tight, and enjoy the ride! We've got work to do! If you want to check out some more pictures of our beauty, check out this post. Labels: big moments, blue water boat, boat, boat selection, buying a boat, cool stuff, thank you, who knew? Congratulations! Can't wait to hear what you name it! She's beautiful. The fact that Rasmus was hard to give up means you loved her because she was home, and this one will become home too! (Our family just moved out of my first home that I bought when I was 20 and it was so hard for me, but so good for our family!) Can't wait to hear more and see more pics! 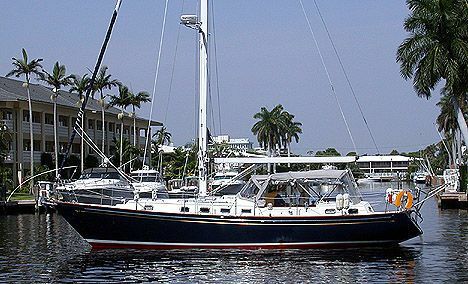 @Seadyce - we used Guy Clifford over at Patton Marine Inc. out of Miami for our pre-purchase survey. We used Nance & Underwood for our rig survey and we used Malcom Parton of Maritime Marine Inc. for our engine survey. All were very thorough and came highly recommended to us from people in the biz for over 30 years. SHE IS BEAUTIFUL ... Congratulations! It's always hard to make a change, but this is going to be great! We're going through a similar (yet so different) experience. We're about to list our house which we've grown to love. But, gotta let go of the past to really experience the future! Looking forward to seeing the inside and wondering what her name is ... or will be. Like most big decisions you do the best you can to get the right info and then you decide and are over the hump. I sure sounds like you did a great job going up the hump and have now got a great solution. Keep us all posted and share some photos. Congratulations, she's beautiful. Here's to new memory-making aboard your gorgeous home! Great,Super,Smashing. Look forward to more adventures with you on this new wonderful yacht. Congratulations Britney & Scott! What a beautiful boat. I actually remember eyeing that boat on yachtworld a week or so ago. Question for you though, two years ago (?) when you bought Rasmus your budget was $60K and this boat likely cost more than double that (guessing from the asking price). Are you guys going into debt for this one? And due to the high cost will you have to change your minds about the self-insurance thing you had spoken about elsewhere? @Dracy - yes, our budget was less then...things have changed for us. 1) We now are making a living while cruising, whereas before we were planning on going off of savings and 2) We know we want to live on a boat for the foreseeable future so don't mind putting more of our money (savings) into a boat (money that might have gone into a home). We are not going into debt. I should also note that we paid nowhere near the listing price. As for insurance, yes, we will be getting some boat insurance moving forward. Not sure what though. Congratulations. I remember the angst and second guessing well, but once you settle down and move in the worry and pain will be forgotten. She is a beautiful boat and you must share her name. Any fear of bad karma if you change her name? All I can say is A/C!!! fridge and freezer are great too! Lovely boat and a great decision! Glad you appreciated my previous thoughts. I'm sure this boat will be great for you and the growing family. CONGRATS!!! once again you made my monday morning at work. thank you so much for sharing so much with us. Brittany and Scott, Congratulations on your new home! Isla will love growing up on her! I couldn't be happier for you guys! Great boat! I looked it up on yachtworld and scrolled through the photos. You will have plenty of room for your family, and although I love our 32' Westsail, I'm somewhat envious of your 8.5 knot capability. We'll get a fleeting glimpse of your boat while you pass us. Great boat and great buy. Exactly the boat I would pick for my wife and I in a few years. Look at that Boom! Why so long? The others of the same model are much shorter. Sweet guys -- glad it worked out! Congrats guys! she looks amazing! Our boat is a central cockpit and we love it, I am sure you will enjoy it.